An automotive tester can be used to inspect one or more aspects of an automobile. For example, a borescope automotive tester is an automotive inspection camera used by auto body mechanics to see inside car, truck and other vehicle engines before removing any engine parts. Other kinds of automotive tester devices are used to adjust belt tension, test the electronic ignition starter, search for air conditioning leaks, measure the force required to press a brake pedal, determine the antifreeze concentration, or check the paint thickness over collision repairs. 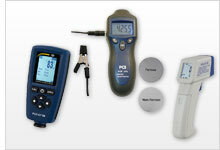 PCE Instruments (PCE) offers a wide variety of automotive tester products. These diagnostic support tools help profesional automobile mechanics identify a number of vehicle repair needs. PCE's automotive tester products can aid in the diagnosis of many different mechanical and electrical system issues, including but not limited to locating the cause of an engine misfire, testing fuel injector resistance, pinpointing an engine coolant leak, or detecting car cylinder head problems. It's no wonder so many auto repair technicians choose to stock theirs shops and garages with PCE automotive tester products. If you have any questions about the automotive tester products found on this website, please contact PCE's technical sales and support team at or +44 (0) 2380 987 035 for PCE Instruments UK, or at or +1 (561) 320-9162 for PCE Americas Inc. The PCE-CT 5000 Automotive Tester is an instrument for a nondestructive thickness measurement of coatings, such as varnishes, paints, etc. on steel / iron and non-ferrous metals. The extremely wide measuring range of the Automotive Tester goes up to 5000 µm or 200 mils. Gumming or plastic coatings for shock and impact protection can be controlled just as the thin paint coatings. Automotive Tester / Coating Thickness Gauge PCE-CT 5000-ICA w/ ISO Cert. The PCE-CT 40 is a Automotive Tester that takes non-destructive measurements of nonmagnetic coating, insulating layer and dry film thickness (DFT) on only ferrous metal substrates such as steel. Ideal for surface testing, automotive paint inspection, material testing and manufacturing quality control applications. The PCE-CT 40 is a Automotive Tester Coating Thickness Gauge that takes non-destructive measurements of nonmagnetic coating, insulating layer and dry film thickness (DFT) on only ferrous metal substrates such as steel. Ideal for surface testing, automotive paint inspection, material testing and manufacturing quality control applications. PCE-CT 50 is a Automotive Tester that takes non-destructive measurements of nonmagnetic coating, insulating layer and dry film thickness (DFT) on only non-ferrous metal substrates such as aluminum, brass, stainless steel and anodized aluminum. Ideal for surface testing, automotive paint inspection, material testing and manufacturing quality control applications. PCE-CT 50 is a Automotive Tester Coating Thickness Gauge that takes non-destructive measurements of nonmagnetic coating, insulating layer and dry film thickness (DFT) on only non-ferrous metal substrates such as aluminum, brass, stainless steel and anodized aluminum. Ideal for surface testing, automotive paint inspection, material testing and manufacturing quality control applications. The PCE-CT 30 is a Automotive Tester that takes non-destructive measurements of nonmagnetic coating, insulating layer and dry film thickness (DFT) on metal substrates such as steel and aluminum. Ideal for surface testing, automotive paint inspection, material testing and manufacturing quality control applications. The PCE-CT 30 is an Automotive Tester - Coating Thickness Gauge that takes non-destructive measurements of nonmagnetic coating, insulating layer and dry film thickness (DFT) on metal substrates such as steel and aluminum. Ideal for surface testing, automotive paint inspection, material testing and manufacturing quality control applications. The revolver PCE-DT 50 in the form of a pistol is ideal for quick control of speeds. This PCE-DT 50 automotive tester measures the rotational speed of moving objects, such as shafts, drives, pinions etc., without contact. The PCE-AT 5 automotive tester / handheld tachometer is a portable device used to measure revolutions per minute (rpm) in one-cylinder two-stroke and eight-cylinder four-stroke combustion engines with electric ignition starters. The PCE-AT 5 handheld automotive tachometer features an easy-to-read, backlit digital LCD display and flashlight functionality for low-light applications. The PCE-S 40 is an automotive-testing acoustic stethoscope which amplifies machine noises. An acoustic stethoscope makes it possible to detect noises in bearings, fan flaps, pumps and similar parts. In mechanical engineering, it is used for preventive maintenance to diagnose potential machine faults before they arise. PCE-SG is an automotive tester or handheld refractometer used to determine the specific gravity (sg) of electrolyte solution batteries as well as the freezing point of propylene or ethylene glycol-based coolants in degrees Celsius (°C). This refractometer works well for measuring cleaning products too. The instrument also gives indication of the charge level in battery acid. The PCE-S 41 Mechanics Stethoscope is battery powered and easy to use. This Mechanics Stethoscope can be used for detecting noise in machine components, such as gears, valves, vents, and pumps. The PCE-CT 25 Automotive Tester is used for quickly detecting the thickness of metals, such as steel and iron (F) as well as non-ferrous metals (N) in the automotive sector. The PCE-CT 25 Automotive Tester is used to detect damages in cars (the coating thickness of paint can say if the car has suffered any damage) to establish if the car has been in an accident and the resulting value of the car in the used car market. PCE-VE 200 is an industrial inspection camera, endoscope or borescope for the non-destructive evaluation (NDE) of engines, machines and more. This industrial borescope provides excellent image quality at an affordable price. An ideal tool for diagnosing issues in hard-to-reach places, the waterproof camera head features 6 LED lights with adjustable intensity for optimal illumination. In addition, digital image magnification or zoom of up to 4 times is available. The automotive-testing mechanics stethoscope PCE-S 42 is designed for listening to individual machine parts. The industrial stethoscope is used to perform maintenance and repair work. The use of an industrial stethoscope thus facilitates the interception of acoustic phenomena on bearings and motors to prevent failures. PCE-VE 200 is a automotive tester / borescope or inspection camera, for nondestructive evaluation (NDE) and machine diagnostics. The PCE-VE 200 automotive tester provides excellent image quality at an affordable price. An ideal camera tool for diagnosing hard-to-reach places, the scope can be rotated 180 ° and offers 6 LED lights with adjustable intensity for optimal illumination. In addition, digital image magnification or zoom of up to 4 times is available. The Automotive Tester / Borescope PCE-VE 300-H is the optimum for experts and development engineers. Choose between many different cables for the videoscope. This automotive tester not only gives you an optical insight into the inner workings of machines and systems without first disassembling them, it also allows images and video sequences of the components to be inspected to be stored directly in the device. The optimal tool for inspection of industrial machinery and equipment. The PCE-VE 200SV1 automotive tester is a nondestructive inspection camera. Thus, the PCE-VE 200SV1 automotive tester is the ideal instrument for diagnosing hard-to-reach areas. Thus, the areas of mechanical engineering, sanitary and heating construction, and the entire construction and construction industry are among the main applications of the automotive tester PCE-VE 200SV1.